I’m fascinated by this house, though I can’t figure out if it ever even existed. 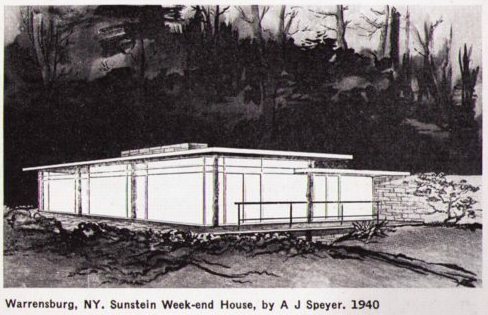 It’s a “mountain week-end house” in the Adirondacks made with “tree trunk posts, slab sides, native stone, and 75% of walls glass.” Its architect, A. James Speyer, was at the time Mies van der Rohe’s first graduate student. Which makes the house sound like the strangely beautiful product of a one-night stand between the Barcelona Pavilion and a log cabin. The house, like the Museum of Modern Art Guide to Modern Architecture: Northeast States it was published in, are both dated 1940, which could explain why there was only a drawing, not a photograph, available. In the last few weeks, I’ve cold-called a few promising-sounding Sunsteins and Speyers, hoping they’re related–and waiting to finally be asked to share their childhood tales of summers at Aunt Bird’s rustic modernist masterpiece. But so far, none of it rings the slightest bell. Next up: contact the archivists at the Art Institute to see if there’s anything that may have fallen through the digitized cracks. Also, post about it online and hope that “Bird” Sunstein’s relatives are Googling during the holidays.